The 'Cat'-astophic Game of Quick Escapes! Run Kitty Run! 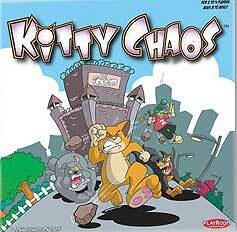 In Kitty Chaos, four kittens have made a daring escape from the clutches of the evil City Pound, which snatches the felines from their owners and sells them to the fatal fur trade. Now they must make their way back through the suburban streets to their loving owners. Unfortunately, their trek is troubled with danger; from vicious dogs to malicious kids, these furry felines have a chaotic adventure in front of them, as the pound van doesn't give up its chase along the way. Your job is to get your kitty back to its correct owner. Luckily, you have nine lives to help you get there - so be the first player to reach your owner's home and win the game!